There are plans to re-open a record shop in Sheffield town centre in 2011. Each year the city (funny – we always ‘go to town’ but refer to the place properly as a city in other conversations) hosts the Sensoria festival devoted to popular music, with gigs and talks. For the 2011 event I have submitted a proposal to recreate one of the original record stores for the duration of the festival. One of the fascias will be redone, and it is hoped to both have some selling stock as well as an exhibition devoted to stores past and present, photographs, displays and much more. The idea is to give local oldies something to get misty eyed over, and young kids a taste of what they have missed with all their downloading malarkey! Plans are at an early stage (we have a particular store in mind) but the festival organisers have a site to go for and we will have more information anon. 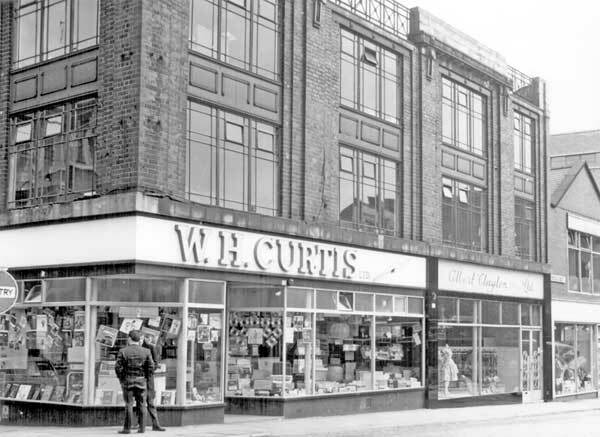 In the meantime here’s a nice photo of the original W. H. Curtis store I found. I don’t remember this one myself, the area was knocked down during redevelopment in the late fifties. It had a small recording studio inside, and occasionally acetates with the store name on do turn up.